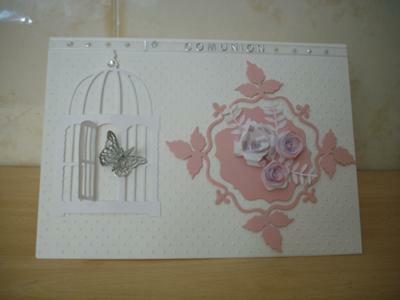 I was asked by a neighbour if I would make two cards for a Spanish friends girls 1st communion as she had so liked the card I had done for her birthday!! Bit of a challenge and hope she likes them. I am not sure if one has a bit to much pink on it as they all dress in white and have a solemn parade around our village so will wait to see what she thinks, if so will have to alter it and try to make it whiter!! What beautiful cards and I wouldn't be able to choose between them. 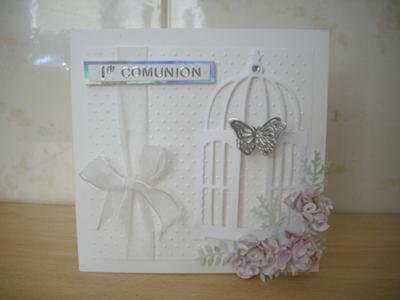 The embossing makes a perfect background and can really add dimension to a card. Love the bird cages, and the flowers on both of them are gorgeous .... and Jacqueline you can never have too much pink ... perish the thought! !